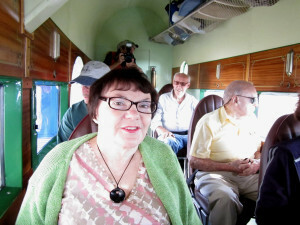 We took advantage of a rare opportunity on Tuesday, January 28th, and we got to ride on a piece of aviation history. 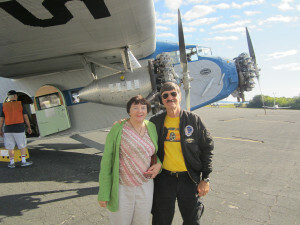 It was an old Ford Tri-Motor which was doing a tour of the United States. It was going to be at Merritt Island airport (almost in our back yard), so we bought two tickets. 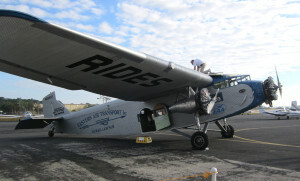 This plane was built in 1929 and was the first aircraft designed and built for the purpose of carrying passengers. Henry Ford produced these planes on an assembly line the same way he built his cars. 199 were built. But very few are still flying. Most are in museums. This one carried mail, worked as a crop duster and saw service with the U.S. Forestry department. It crashed in the sixties and sat dormant for twenty years, but the Experimental Aircraft Association bought it and shipped it to Oshkosh, Wisconsin where it was rebuilt and put back into service. Now it travels around the country giving rides to paying passengers as it was always intended to do.